Face masks effectively cover the nose and mouth. During outbreaks, wash your hands frequently. Dispose mask after the first use itself. Whenever there is an outbreak of flu, people start looking for ways to reduce the spread. Not having vaccines for flu makes it even more crucial to discover other ways to prevent the infection from spreading. 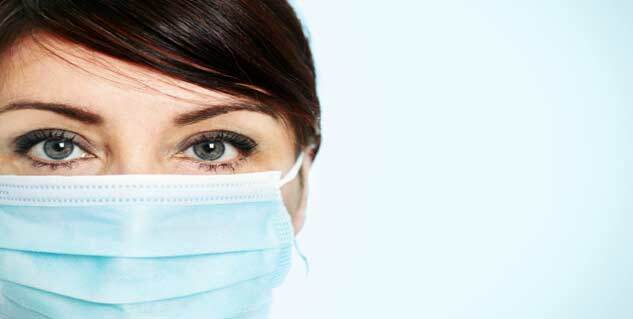 People tend to start wearing surgical facemasks to reduce risk of getting infections. But, do these masks really help? A 2008 study published in the International Journal of Infectious Diseases concluded that when used correctly, masks are capable of reducing risk of getting infections by up to 80%. Researchers also observed that the difference between types of masks used in the study was significant. Another research from Annals of Internal Medicine involving 400 people with flu found that their family members were able to reduce their risk of infections by wearing surgical masks and washing hands frequently by up to 70 percent. However, a University of Michigan study found promising results when people washed and often along with wearing masks, but found no reduction of risk by mask use alone. So, if you wash your hands often, surgical masks can greatly reduce the risk of getting flu. Here are some types of masks people commonly use. Facemasks are loose-fitting, disposable masks that cover the nose and mouth. Facemasks can further be of different types such as surgical, dental, medical, isolation, and laser masks. These masks are intended to stop droplets from spreading from or reaching the mouth and nose of the person wearing them. Respirators are tight fitting masks, designed to prevent very small particles–that might contain viruses–from entering the nose or mouth of the person wearing them. N95 is a popular example of respirators. So, it's best to wear masks and wash your hands often to prevent flu spread. However, remember that surgical masks or respirators should be disposed of after single use.